Since we bought and moved into our new home, we’ve been really wanting to make it our own. But with a new baby, a family wedding (and LOTS of family visiting from abroad) it’s been slow. One room we’ve really been slowly turning around is our “master bedroom”. 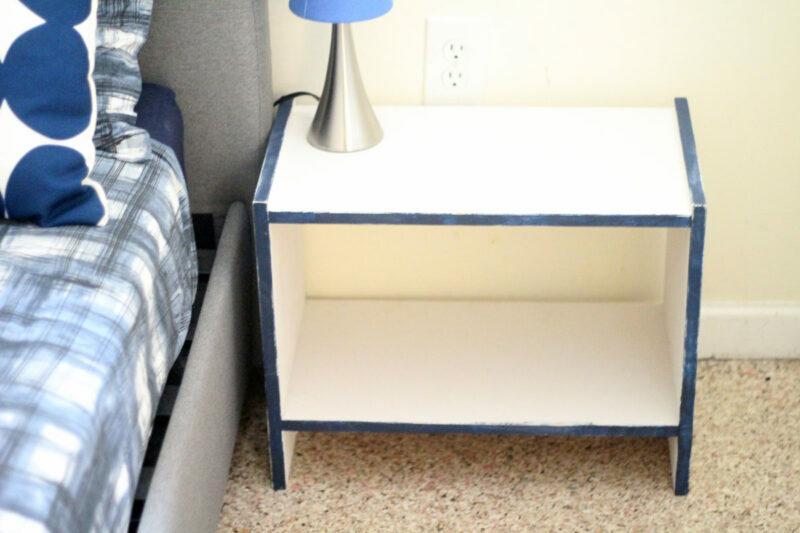 This DIY color accent nightstand is a simple IKEA RAST Makeover that really pulls things together. The reason I put “master bedroom” in quotes is simply because we don’t have a full-fledged master bedroom. We are living in the small apartment of our two family home and will likely move around within this house later on. So we don’t necessarily want to renovate, turn it into a real master. 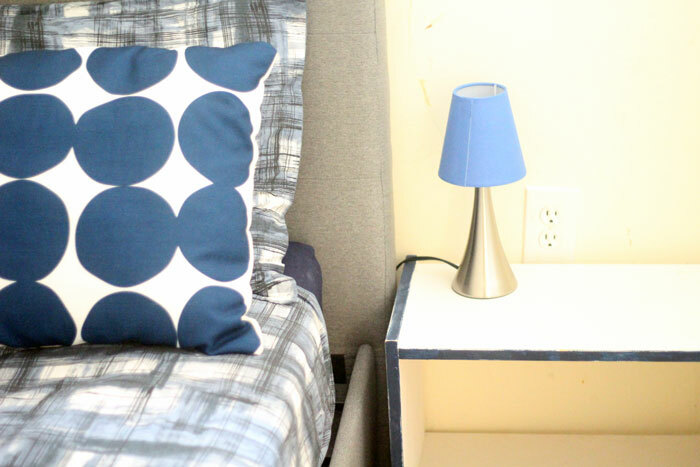 You might want to get inspiration from our room for a guest room, teen child’s room, or even your own master. 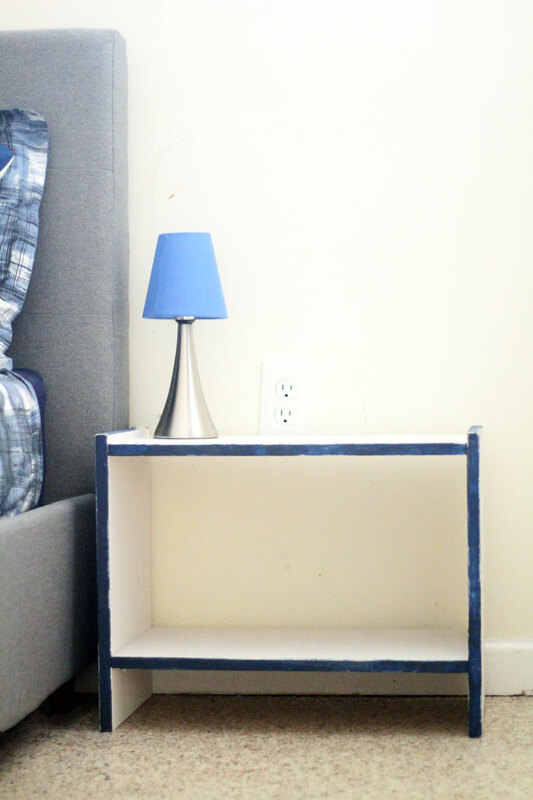 I’m not quite ready so show you the full design (we have a corner we want to convert into a closet, a huge dresser we need to figure out…), but I figured I’d share this IKEA RAST makeover to show you how a simple color accent nightstand that takes about an hour to make can really pull a room together. My first move with making over this room was buying the beds. We were debating whether to get the cheapest option that works, or to spend a little more and get something we like. 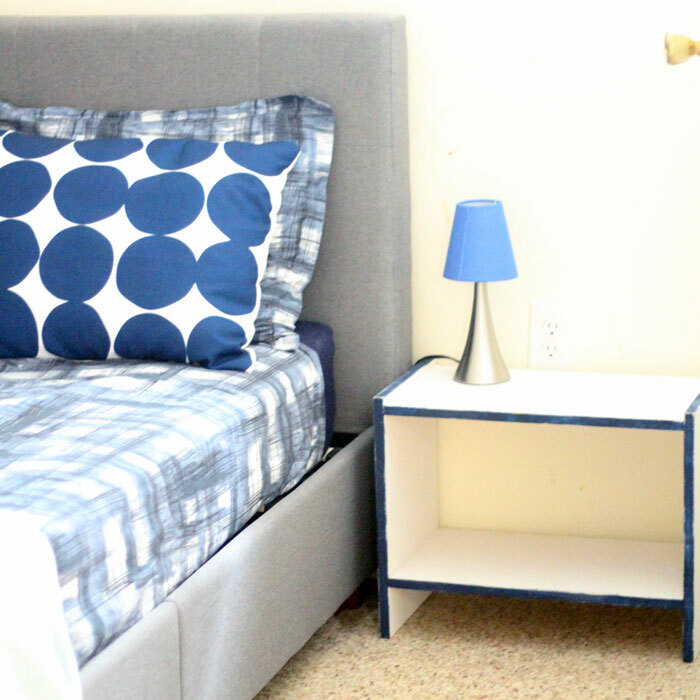 We ended up finding these beautiful linen upholstered beds for a ridiculously cheap price! Next up was the linen! Our old linens were warmer colors – oranges, golds, mixed with lots of green, and simply clashed with the gray. I like to “break the mold” of what people would expect me to get for my bedroom and picked up this set. I also got these lamps to match and to brighten it up a bit with the sleek base. 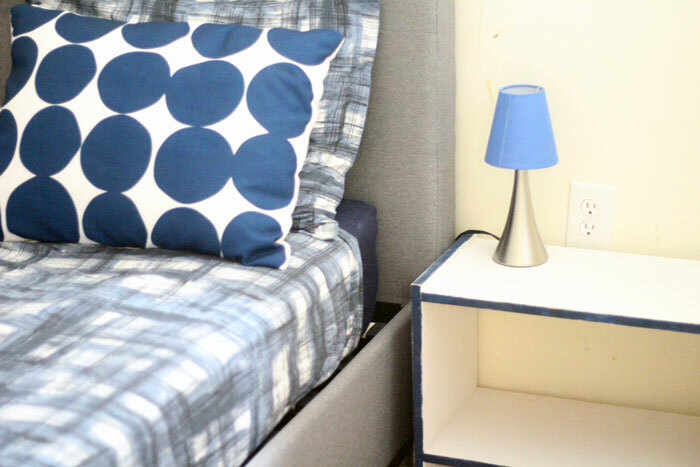 I picked up a set of plain navy blue bedding , mainly for the sheets, but I also thought it would be nice to layer the duvet with a top sheet, and add a solid colored pillow for contrast. We received a lovely light blue throw that goes surprisingly well, and makes the edge of the bed extra comfortable to sit on (there’s no space for a bench). 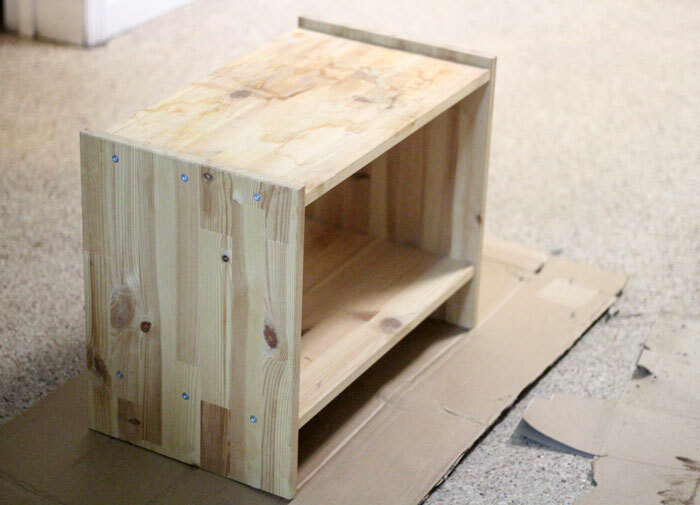 We had these two IKEA RAST nightstands – solid pine, unfinished, waiting to be turned into something beautiful. 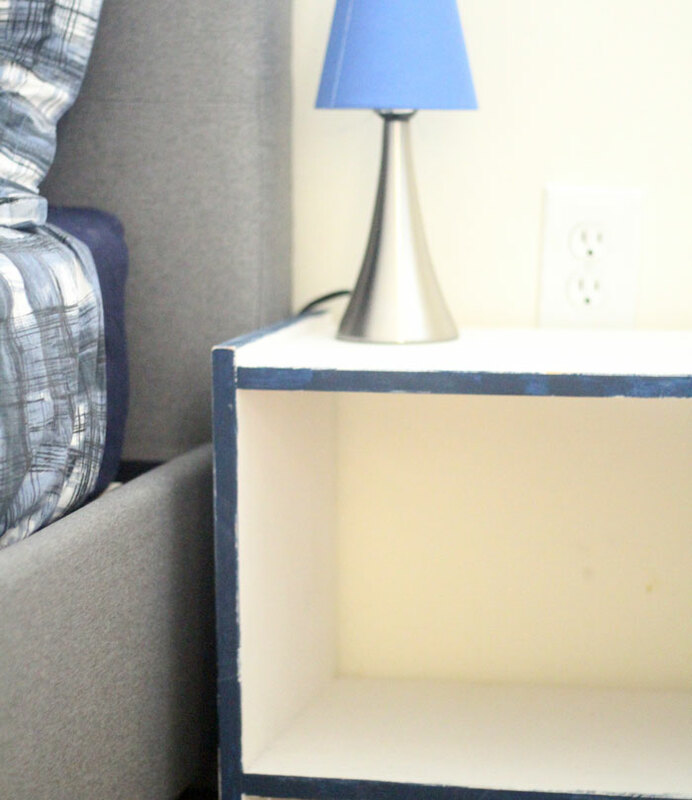 Normally, I’d just stain and call it a day, but we had gotten these cheap nightstands from someone second-hand, and they were badly stained on the surface. 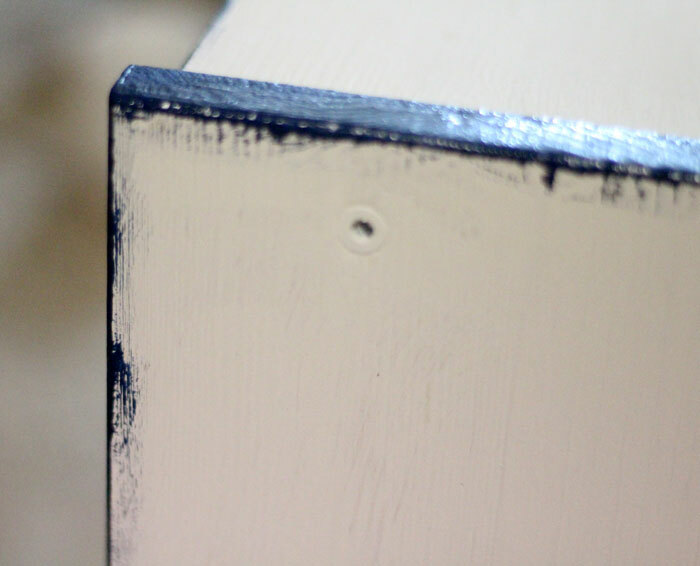 I honestly had no patience to start sanding off the stains (one of them was full-on toddler-style marker stains). I decided to turn them into something that will coordinate nicely with the room. 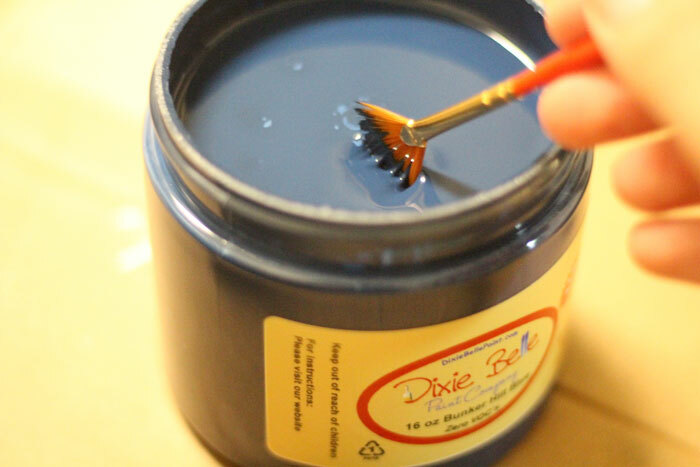 The Dixie Belle Paint company had sent me some samples of their chalk mineral paints – a thick paint that is very forgiving, adheres easily, and doesn’t even require pre-sanding. 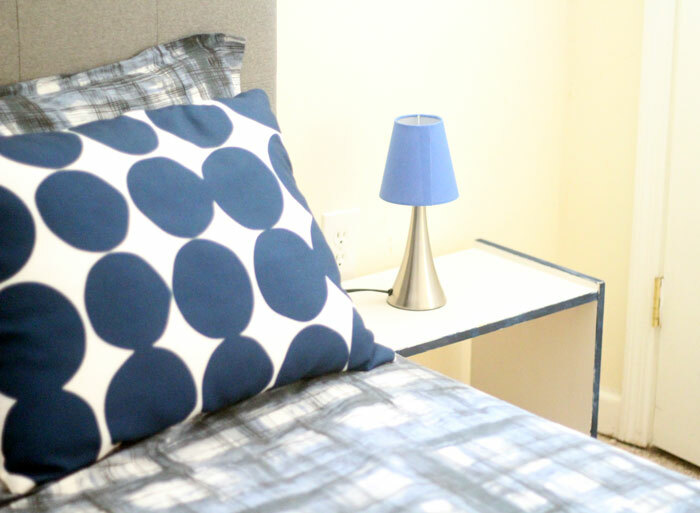 I decided to try a wash of white, to brighten up the “dark” that the bedding had brought into our room. But I wanted something that would tie it in. I had no idea where to go from there. I consulted in a home decor forum, and everyone unanimously voted on colored edges. 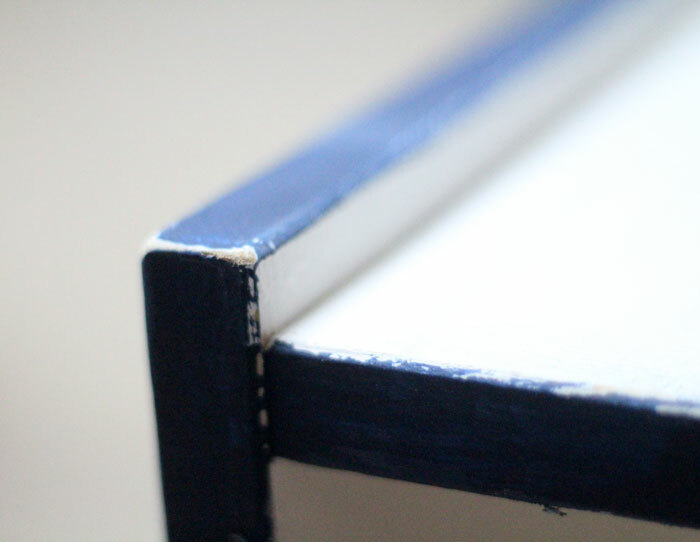 So I perked up those front and top edges (the backs are still white – sh, don’t tell!) with a little navy blue. We finished it off with a little roughing-up to make it work with the bedding. Scroll down to the instructions to see just how easy this is! 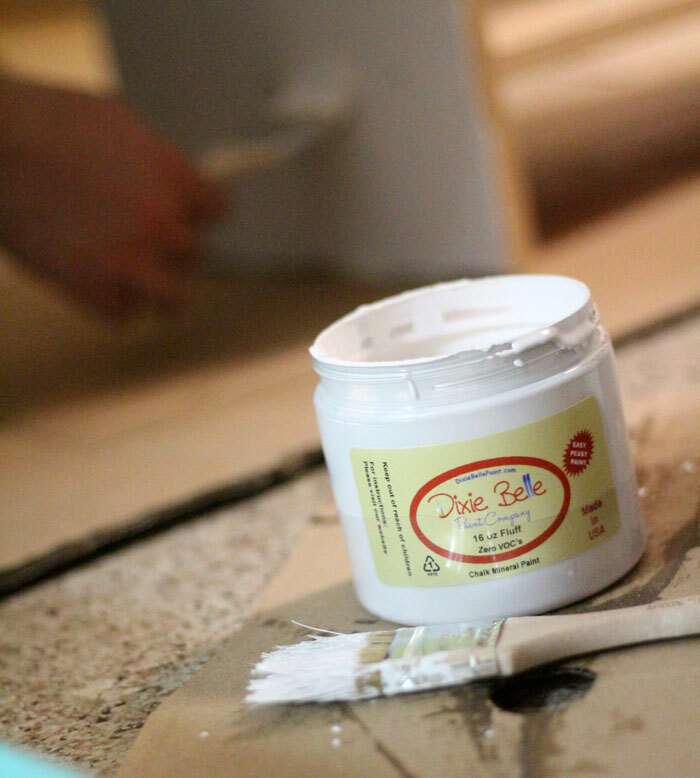 One layer of paint, no taping, no prepping – we seriously did it after tucking in the kids and before calling it a night. 1. 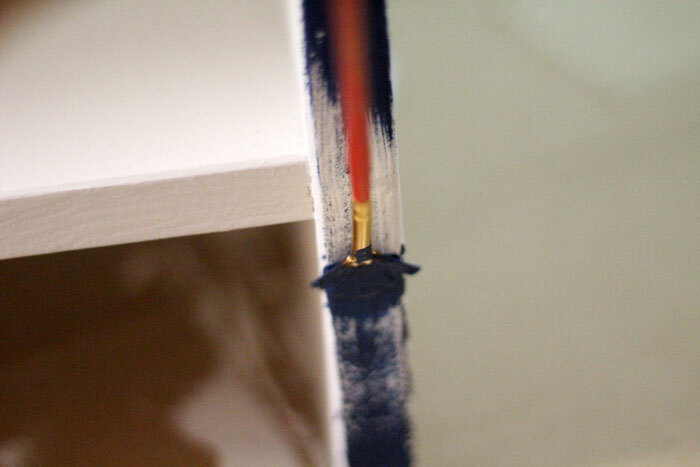 Make sure there’s no dust on the surface and start painting! 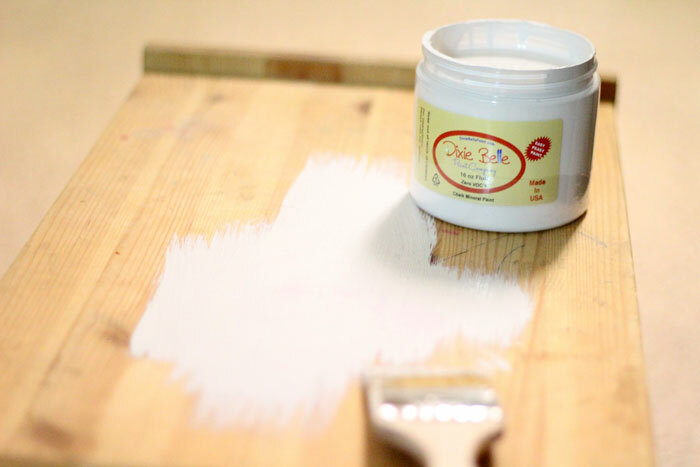 You can dilute the paint for a thinner wash but I didn’t as I had stains I wanted to hide. 2. Choose your accent color. 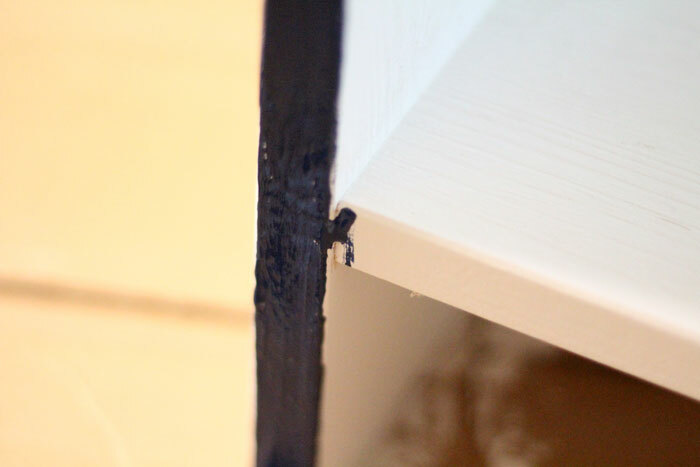 You do NOT need painter’s tape for this step! 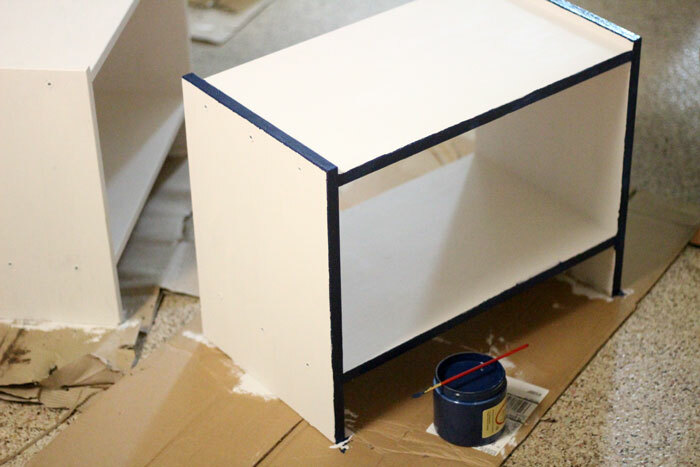 At first I started painting it in slowly and neatly, but I did not like the look. I ended up going up and down in sweeping motions. It created a neat-but rough edges and occasionally the dry brush went over the edge to give it a bit more of a rustic look. 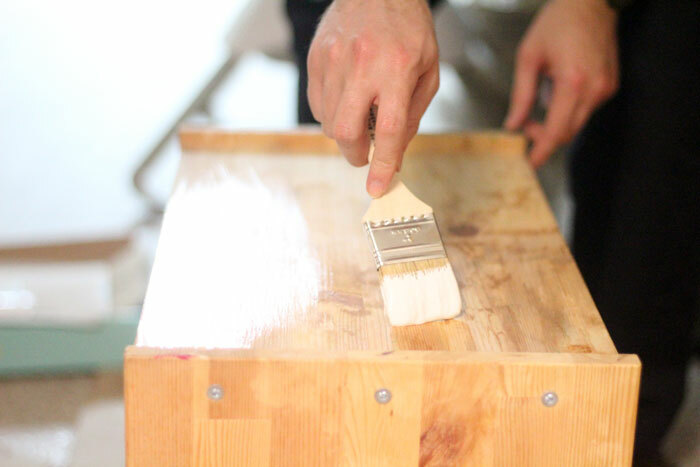 Do NOT thin the paint for this step. Make sure you go into the corner where the horizontal and vertical edges meet. 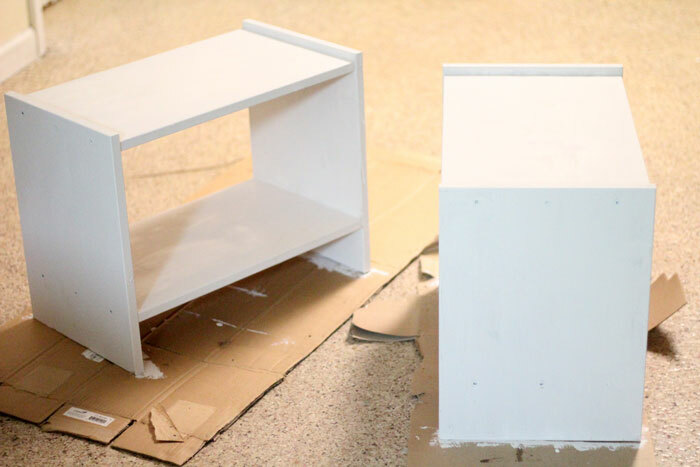 Paint the entire front and top edges – anything that will show! 3. If you’re feeling brave, add a little more rustic edges. You can do this with a very dry brush (test it before painting), by making small strokes on the sides of your color accent edges. 4. 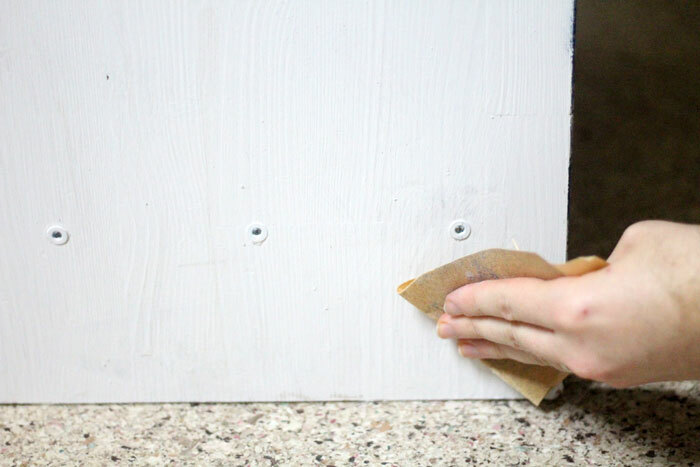 Take your sandpaper and hack away! Let out all your stress on this step (true story..) The more stressed out you are the better. Focus on the corners and edges where natural wear will happen. Let the white show thorough, and on the very edges let the wood show through as well. 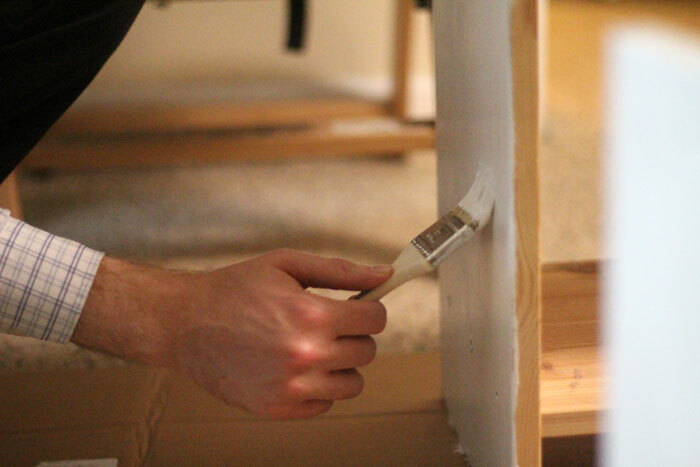 You can rough up the flat surfaces too. Needless to say, we are quite satisfied with the look. Now we just need to get to organizing the closet, putting up wall art, window treatments, building our mini closet, dresser… the list is endless!! Stay tuned! Crafts for Adults, Crafts for moms, Grown-ups, Home and Organization, Home Crafts and DIY. Bookmark.